2x Magnification 5 M.O.A Red Scope, 100% Waterproof, fogproof and shockproof. 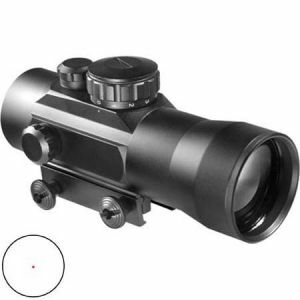 Light Weight and Compact Size 5 M.O.A Illuminated Red Dot reticle Designed for quick targeting in low light conditions. Multi-Coated optics for crisp clear images. Glare Reducing Coatings. Wide field of view. Long Battery Life.Quick Targeting, Windage / elevation and Reticle brightness adjustments Batteries Included. Suitable for air guns.